Structural repair and stabilisation works have always been at the heart of our business. We’ve built a reputation for providing fast, effective remedial measures to address a wide range of structural faults whether large or small. St Astier specialises in dealing with structural failure in all manner of environments from modern and non-traditional housing, listed properties and scheduled ancient monuments, to commercial and industrial buildings. We are called upon to strengthen structures in order to improve their load bearing capability, provide rapid foundation solutions for single storey extensions, deal with leaning and bowed walls, cracked masonry and subsidence issues, carry out structural concrete repairs, and restore the integrity of structural timber. The most appropriate structural repair system will be determined by a thorough survey diagnosis to uncover the full extent of failure and its root cause. As approved installers for a number of proprietary structural repair systems we are ideally placed to handle even the most challenging structural problem. 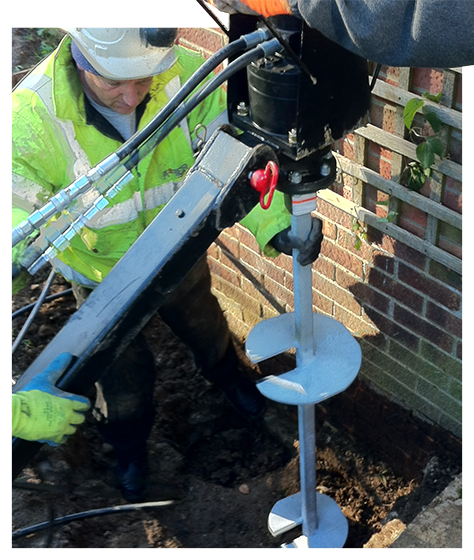 We are approved for and experienced in using: advanced mini pile and helical bar systems; ground anchors supplied by the likes of Cintec, Platypus and Ischebeck; specialist materials supplied by Fosroc, Sika and Remmers. We are also an approved installer for QuickBase – a rapid modular foundation system. Explore some of our Structural Repair projects. The following services are related to our Structural Repair works.